Furniture is a necessity for every home. It's what makes a room comfortable and inviting and lets you express your style and personality through the style of furnishings you choose. But good quality furniture can be expensive. Between my five year old using the furniture as her personal gymnastics equipment and my two year old expressing her artistic abilities (sharpie style) on the sofa my furniture gets a beating. So I hate spending a fortune on things that may or may not make it through the day. 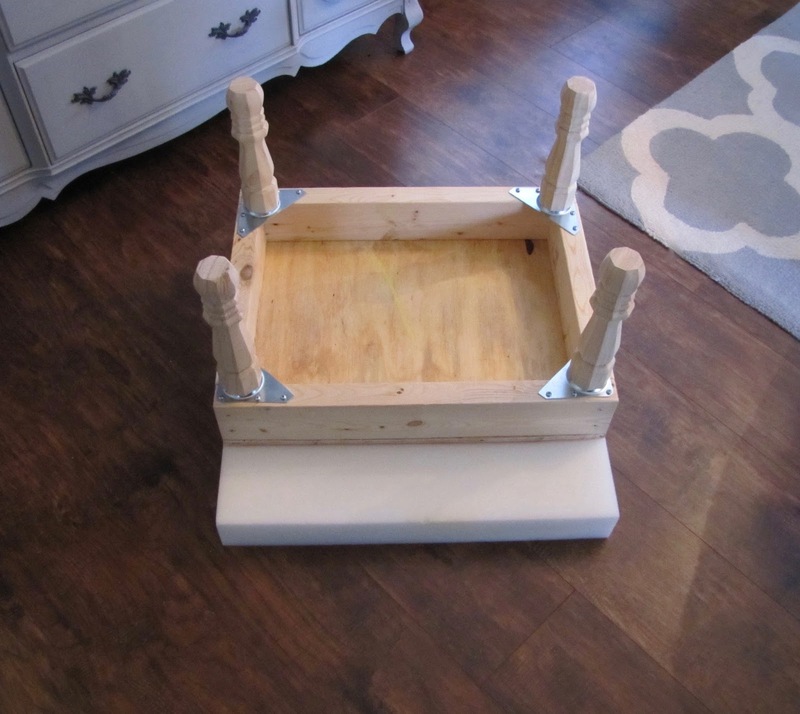 When my previous ottoman bit the dust I decided to get creative and build my own replacement. 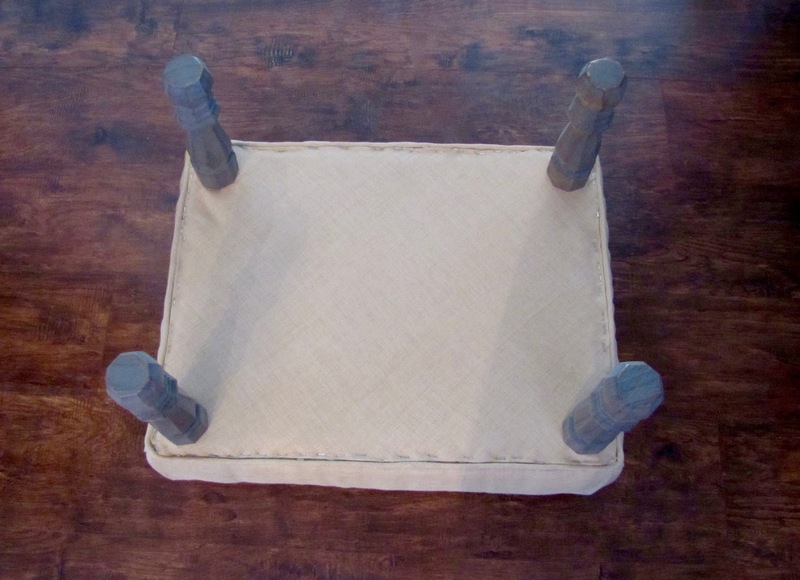 I built an ottoman like this one as a demonstration at the 2016 Ledger-Enquirer Home and Garden Show. It was pretty easy with the help of Home Depot. Keep reading for the tutorial on how to make your own! 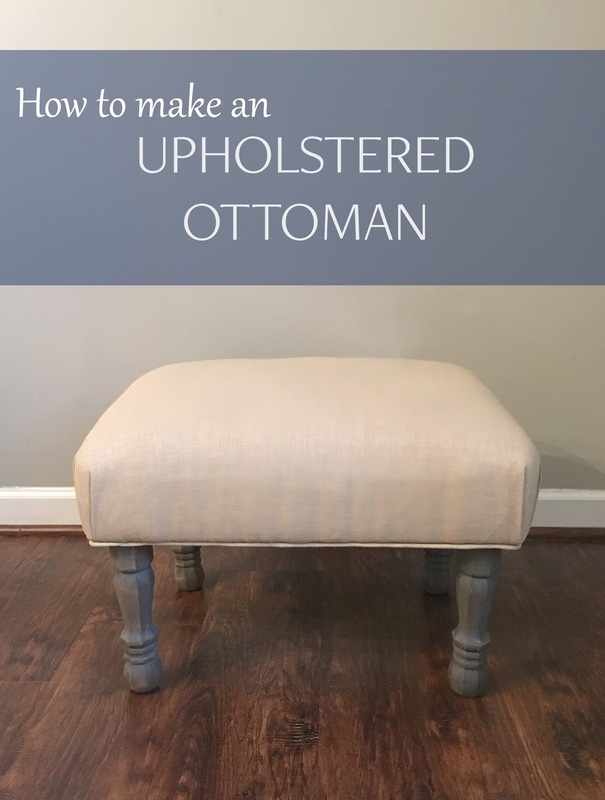 The first thing you'll want to do is decide on the measurements for your ottoman. 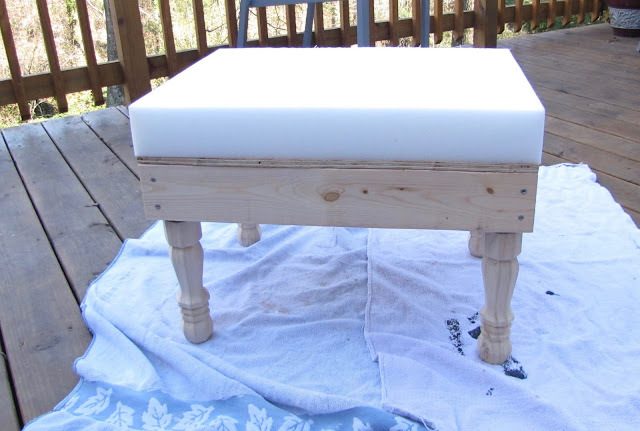 Mine was going at the end of a chair so the finished product measures about 22" long by 17" wide by 16" tall. 1/2" thick plywood cut to 22" x 17"
I had Home Depot cut the 2" x 4" down to size for me at the store. It was such a time saver and made it easier to transport everything in my car. 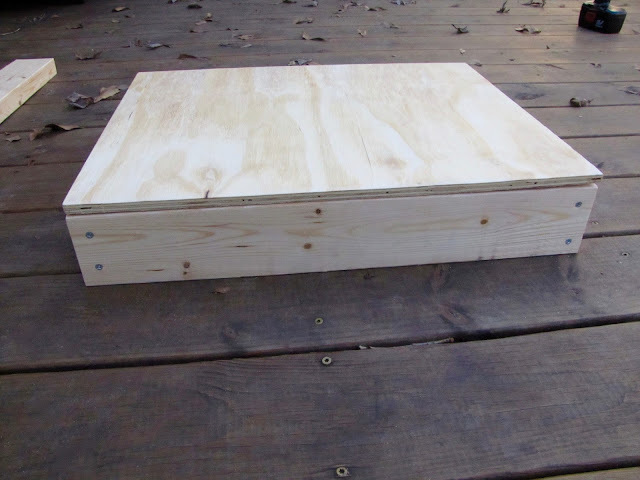 The 1/2" thick plywood should be cut 22" x 17". 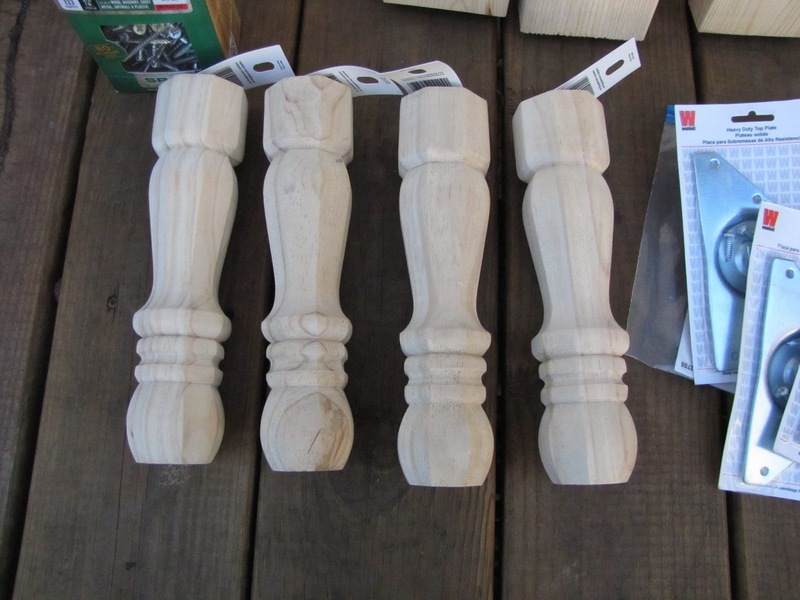 You will have a left over piece from this you can use for another project. 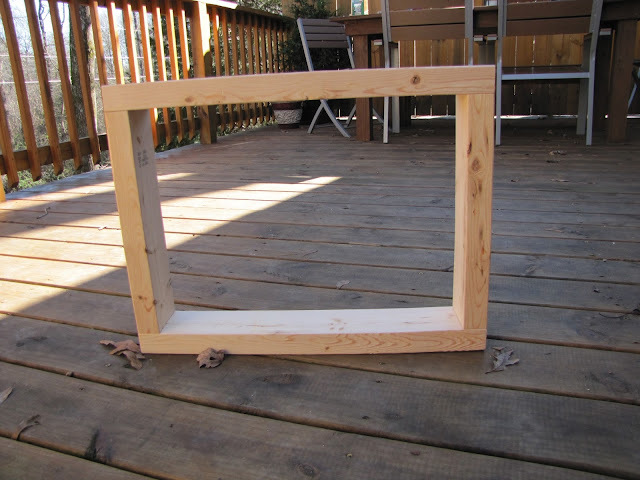 Below is a picture of the items I got from Home Depot to build the frame. 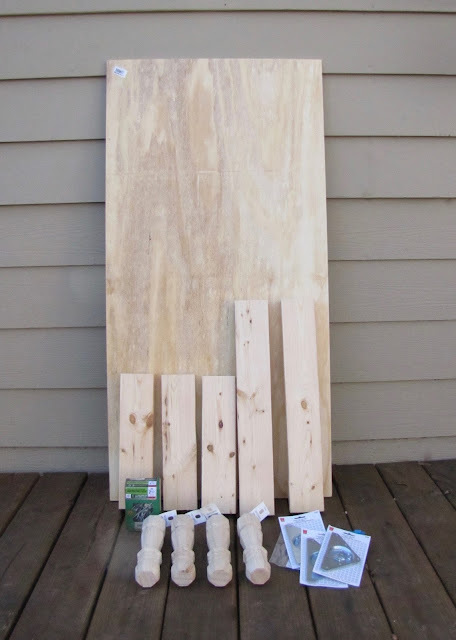 I ended up just bringing the plywood home and cutting it myself using my circular saw. Now to put the frame together. The 2 shorter 14" pieces will go in between the 22" pieces. Making the finished measurements 22" x 17". Once I was sure everything lined up correctly I screwed my boards together one at a time using 2.5" construction screws. Once it's all connected it will look like the picture below. I used the sanding block to smooth down the rough edges where the lumber was cut. You won't see it so it doesn't need to be perfect, you just don't want it to snag the fabric while you're working. 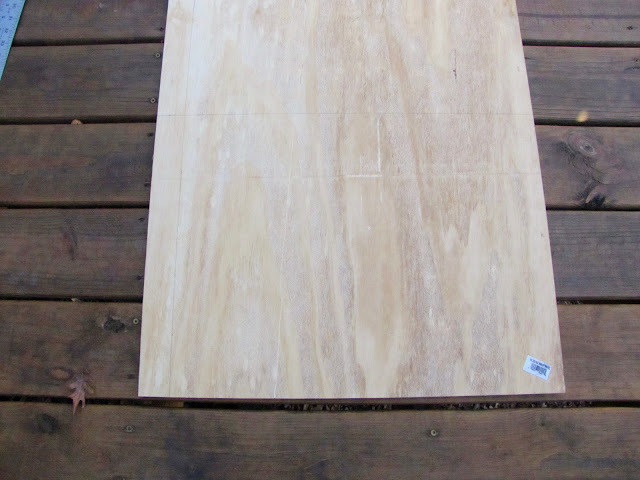 I measured my plywood and marked where I needed to cut with a pencil. 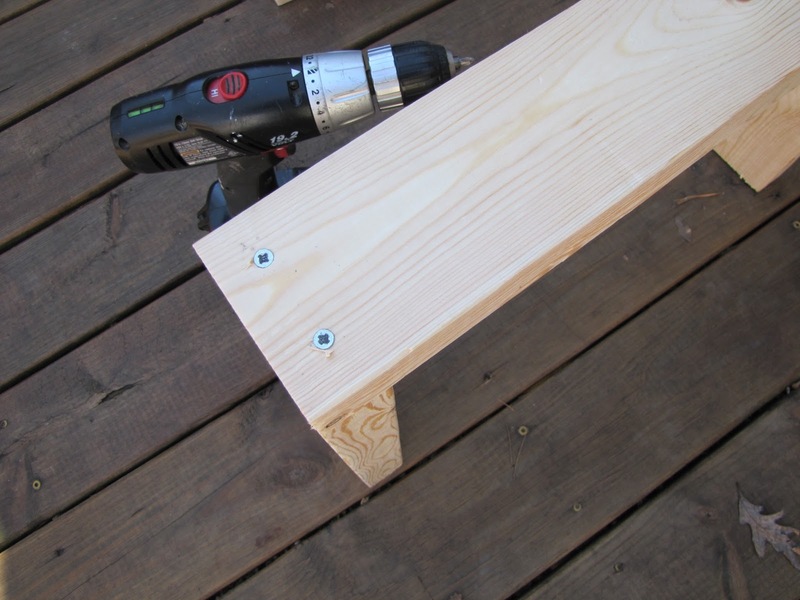 Home Depot can do this step for you if you prefer not to cut yourself. Next, I placed it on top of the frame and screwed it right into the base from the top. I put a screw in each corner. 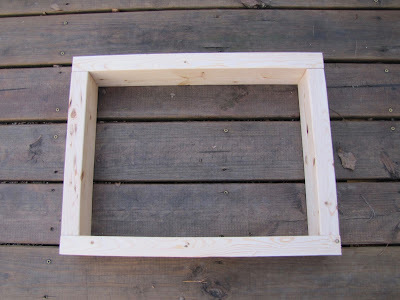 You want to make sure you don't screw on top of the screws used to hold the frame together. You don't need to put the legs on until after you have upholstered the ottoman but here is an idea of what it will look like with the legs on. Now onto the upholstering. I purchased this 3" deep foam from Hobby Lobby. It was almost the exact dimensions I needed with the exception of one side. 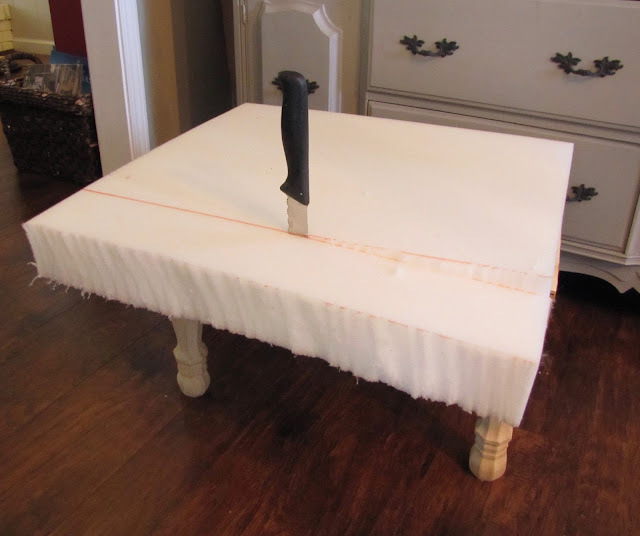 I placed the top of the ottoman against the foam and drew a line with my marker where I needed to cut. Once I cut the foam, I glued it down to the top of the plywood using spray adhesive like the one below. Since it's a spray, you want to put some old towels underneath it so it doesn't get everywhere. 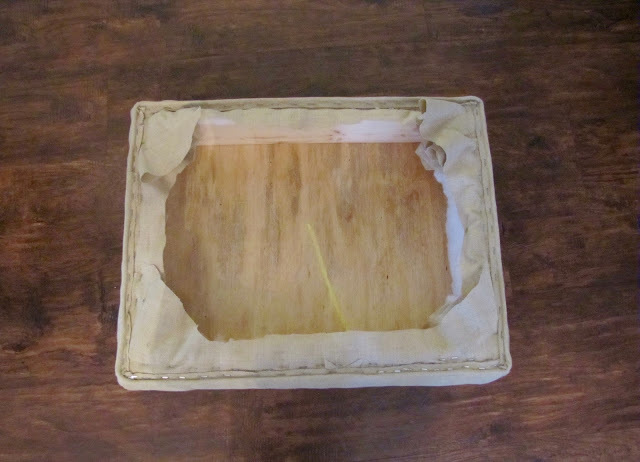 I sprayed the top of the plywood well with the adhesive and the underside of the foam, let it dry to a tack for 1 minute and then lined up my foam on top of the plywood. Press down lightly for a few seconds and then I set it aside for a little while to make sure it was completely dry before continuing the upholstery process. There should be instructions on the can of adhesive as to how to bond so follow the instructions for your specific spray. Next, it's time to wrap the foam with quilt batting and fabric. Pictured below is the kind of quilt batting I used. This one is twin size so I just cut out what I needed. You need enough to wrap it up and around the sides of the ottoman. I like to wrap mine with two layers of batting so I cut out two pieces. 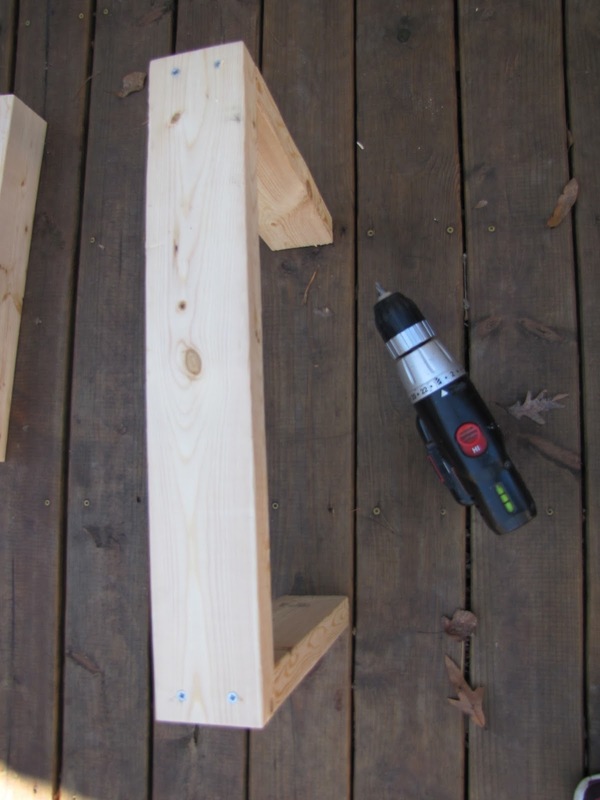 I didn't have the legs or brackets on for this step. It's much easier to wrap everything around smoothly without them. 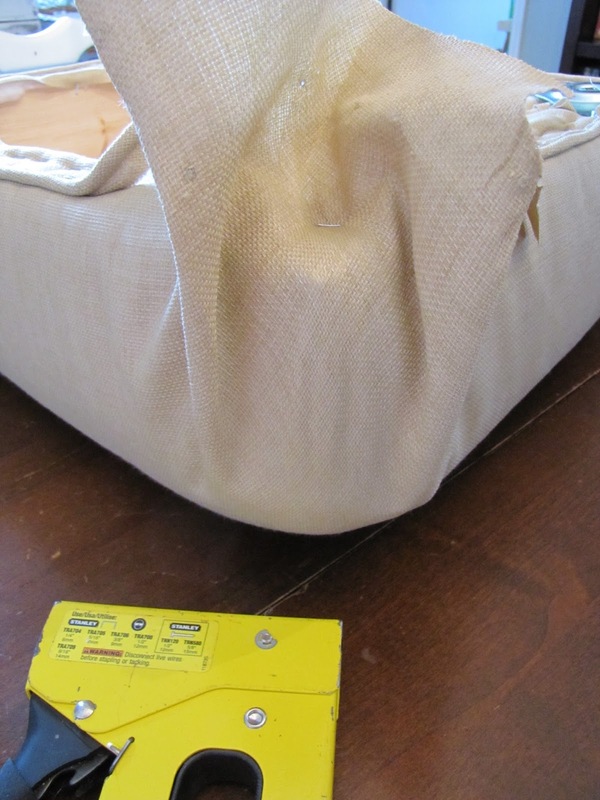 You want to cut the bulk of the batting out of the corners and staple the ends to the inside of the ottoman. 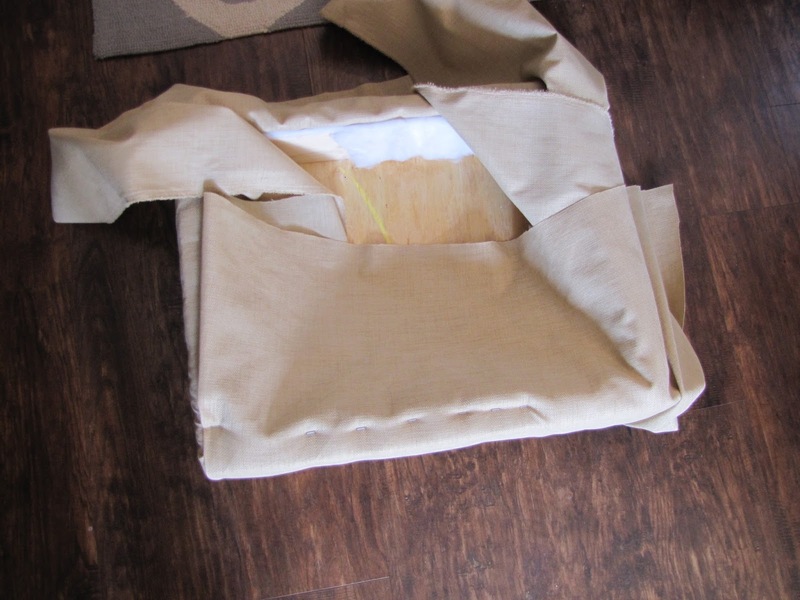 Next, I wrapped the fabric around the batting. 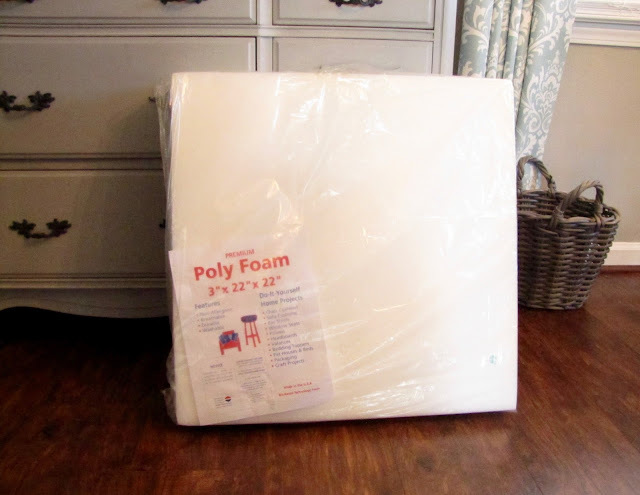 I chose an indoor/outdoor fabric for durability and so far it is really easy to clean. 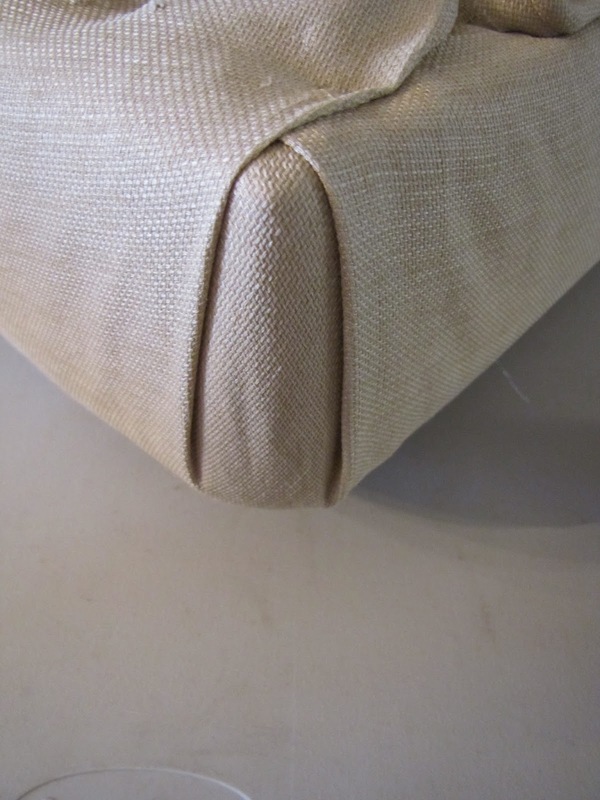 Pull the fabric tightly around the sides of the ottoman making sure to smooth out the fabric as you go along and staple it underneath. I cut off the excess fabric from around the edges once everything was stapled down. For the corners, I pulled the middle section in tight and stapled it down. 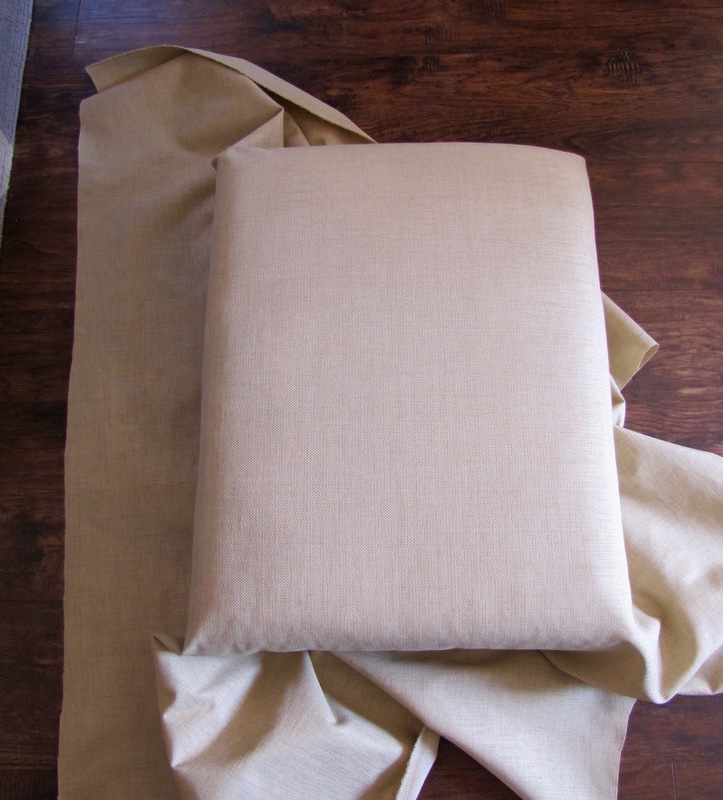 Then I tucked the excess fabric into the folds on either side. Make sure to cut off excess fabric as needed to reduce bulk. You want it to lay as flat as possible so the brackets will lay straight. Here is a look at the bottom with everything stapled down. 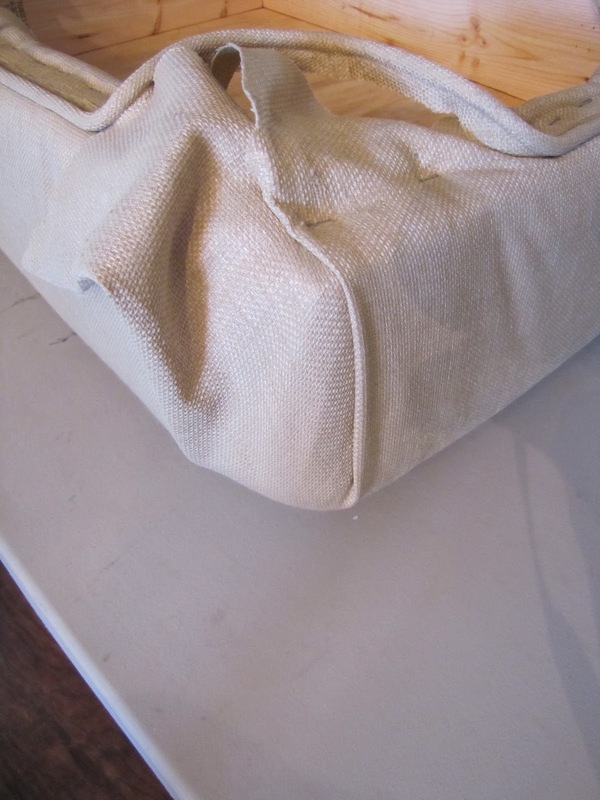 I covered some cording with the same fabric and stapled it to the bottom to add a little something extra. Nail head trim would look really pretty around the edge also but this step is optional. 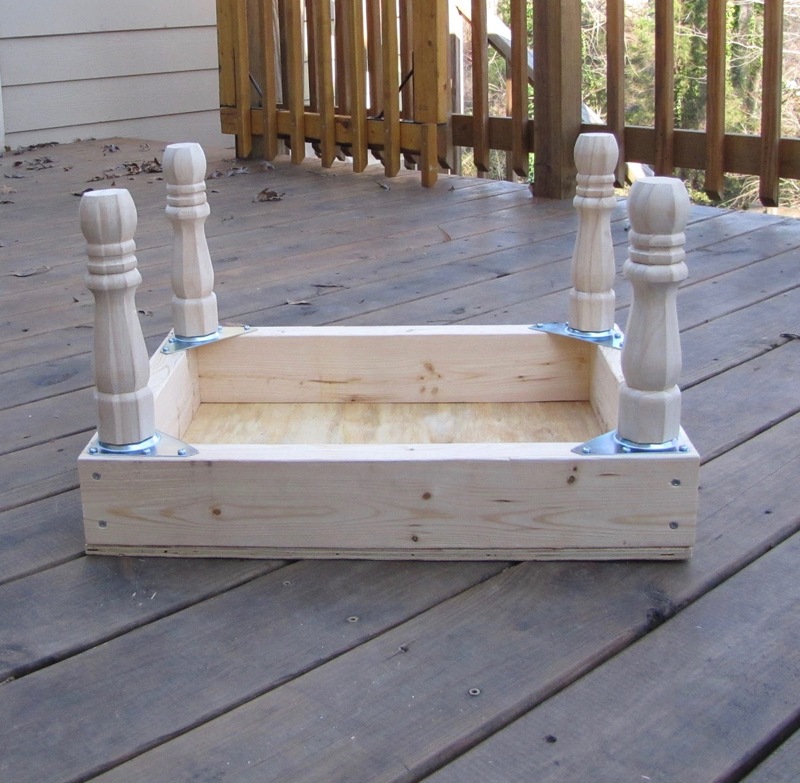 Now it's time to add your brackets and stain or paint the legs. 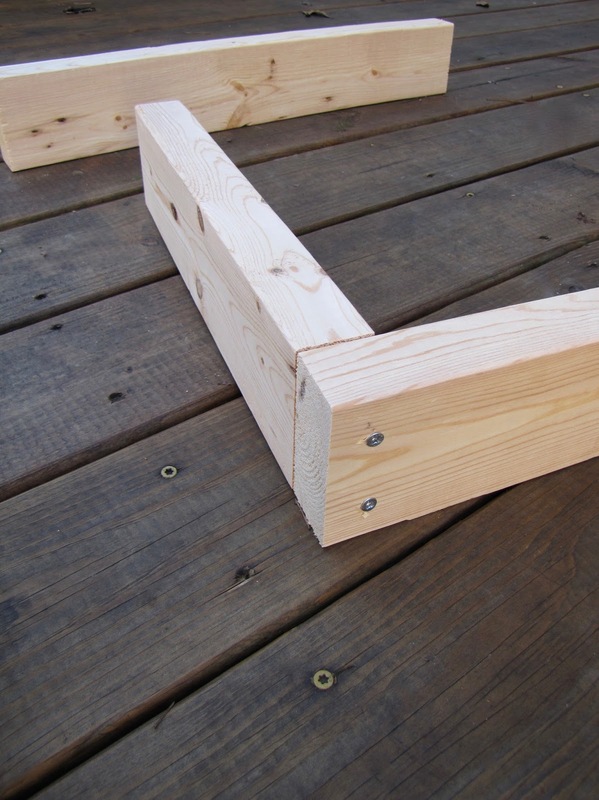 Home Depot has a great selection of unfinished wooden legs and the brackets are located right beside them. I stained these with a coat of Rustoleum's weathered gray followed by a coat of Minwax provincial. 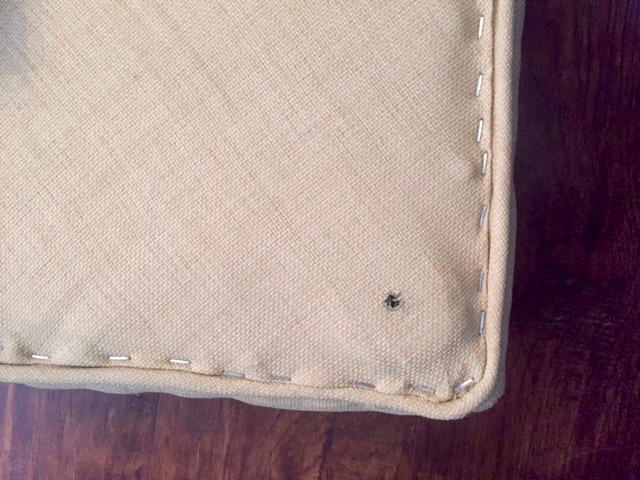 Screw on your brackets to the corner edges of the ottoman. 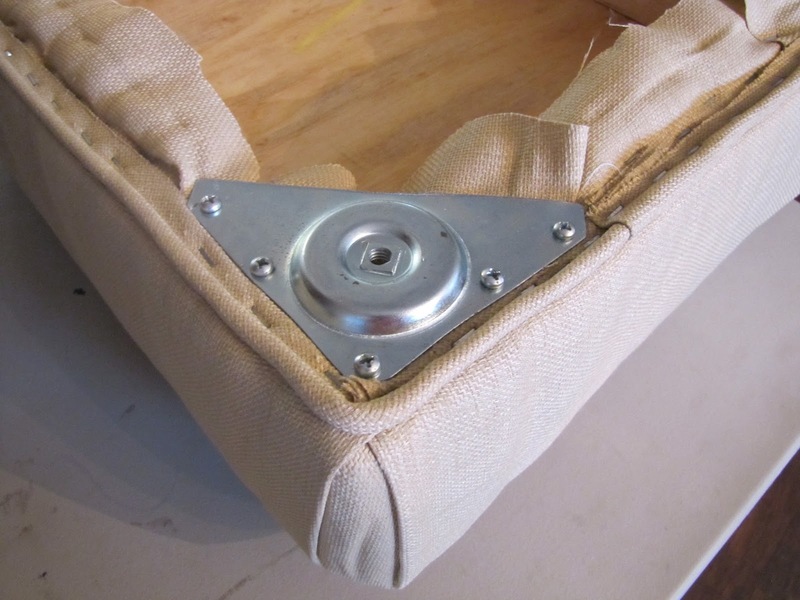 You will need to leave a small space between the edge of the bracket and the edge of the ottoman to staple on the bottom piece of fabric. Take the other piece of fabric for underneath the ottoman, turn under the raw edges and staple it to the bottom. You will need to poke a little hole where the leg screws into the bracket. They have specific fabric you can get that is designed to go under furniture. I just happened to have extra of this fabric so I used that instead. Any fabric you choose will work fine. Lastly, just screw the legs into the brackets and you are good to go! Wasn't that fun? The best part is when my toddler sneaks out of the kitchen with her smoothies or sharpies or the coconut oil hopefully this outdoor fabric will be a little more forgiving. And if not it's small enough that it won't be too costly or time-consuming to recover. 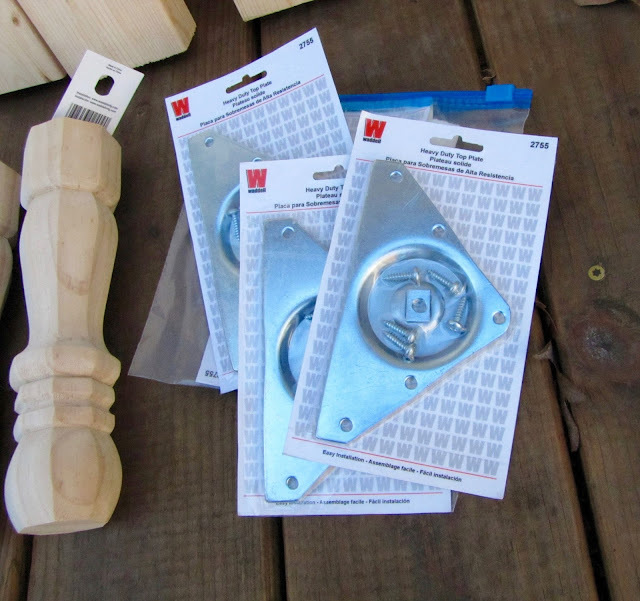 Now to switch out the flooring—kid resistant outdoor rugs here we come!